SORRENTO have edged out Mt Eliza in a thriller at David Macfarlane Reserve to back up their impressive victory over the Stonecats last week. The Sharks were once again made to fight back from behind, after a five goal to zero second term had the Redlegs 29 points up at the main break. After not making much progress chipping away the deficit in the third term, Sorrento required a massive final quarter to win. A six goals to zip surge in the last quarter saw the Sharks drag themselves over the line in a hard fought 11.13 (79) to 10.11 (71) victory. Luke Lowden and Leigh Poholke scored three goals apiece for the Sharks in their winning effort. Frankston YCW had less trouble in their clash against Mornington, as they made amends for their round one loss in convincing fashion. The Bulldogs looked on the backfoot from the get go, as YCW managed an astonishing 51 shots at goal. Their inaccuracy stopped the margin from blowing out to a disastrous degree. The Stonecats showed their intent to improve in 2019 by securing the win 9.6 (60) to 19.32 (146). Lachlan Street was best afield for the Stonecats, kicking four majors. Jackson Calder did his best for the Bulldogs and scored five. Dromana continue to look right at home playing Division One football, as they got the best of Frankston Bombers. Playing at home, Dromana were able to put the game to bed with a first half in which they held the Bombers goalless. Down 47 points at the main break, the Bombers could do little to fight their way back. Although much better in the second half, the Bombers still succumbed to a disappointing defeat 13.10 (88) to 6.12 (48). 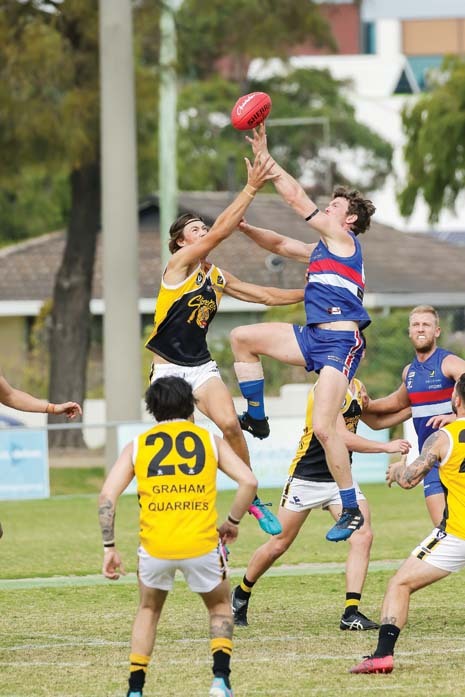 At Eric Bell Reserve, Pines continued their premiership defence with a scrappy win over Edithvale-Aspendale. Pines led at each break in the low scoring affair, although Edi-Asp kept in touch. The final score read 9.14 (68) to 7.4 (46). Bonbeach enjoyed a victory over Rosebud at home, thanks to a six goal haul from Joseph Fisscher. Rosebud started well but eventually fell away, losing 12.14 (86) to 9.7 (61). Bonbeach will take on Edithvale-Aspendale in a Good Friday clash at Regents Park this weekend. The action will kick off from 2pm, with both sides looking to move to 2-1 to start the year.